Growing antibiotic resistance requires a multi-prong response, including more judicious use of antibiotics by doctors, a drastic reduction in the routine use of antibiotics in healthy livestock and more effective action by hospitals to protect patients from dangerous superbugs, according to Consumers Union, the policy and advocacy arm of Consumer Reports. The CDC report notes that up to half of all antibiotics prescribed by doctors each year are either given unnecessarily or used improperly. Consumer Reports’ Choosing Wisely campaign, a joint effort with the American Board of Internal Medicine (ABIM) Foundation, is working to reduce waste and harm in medical care, including the overuse of antibiotics. As part of that effort, multiple medical groups, including the American Academy of Family Physicians and the American Academy of Pediatrics, have identified common conditions for which antibiotics are overused. Those include problems such as mild sinusitis, the common cold, and eye and ear infections. Some 80 percent of all antibiotics sold in the U.S. are used not on humans but on animals — mostly livestock that aren’t sick. Consumers Union believes that to preserve antibiotics for treatment of disease in people, they should only be used on animals that are sick. 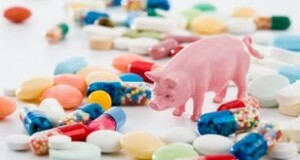 Consumers Union has long urged the U.S. Food and Drug Administration and Congress to prohibit antibiotic use except for treatment of sick animals. In addition, Consumers Union has called on major supermarkets to address this public health crisis by ending the sale in their stores of any meat or poultry that comes from animals routinely fed antibiotics for growth promotion or disease prevention–and is asking Trader Joe’s to lead the way. The CDC’s report estimates that 23,000 Americans die annually as a direct result of antibiotic resistant infections and most of those are due to healthcare-acquired infections. Many more die from conditions that were complicated by such infections. In addition, 250,000 are hospitalized with Clostridium difficile (C. difficile) infections and 14,000 patients die from them. According to the CDC, the use of antibiotics is a major contributing factor in these C. difficile infections. Consumers Union’s Safe Patient Project has been instrumental in getting states to pass hospital infection reporting laws that eventually influenced a national program reporting infections from most U.S. hospitals. These reports have been key to stimulating prevention programs and provide the tools for assessing whether progress is being made. Studies show that simple prevention steps when care is provided in the healthcare system can significantly reduce infection, including strict hand washing, careful preparation of surgical sites, sterile insertion of central lines, bladder catheters and other devices, as well as only using them when needed and prompt removal when they are not.